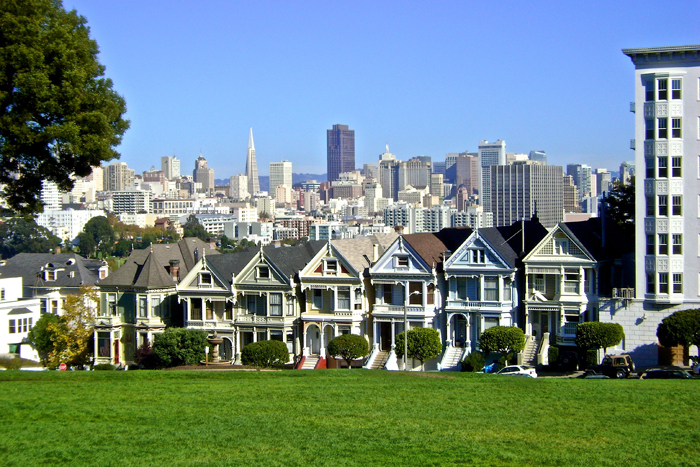 The “Painted Ladies” of San Francisco, a group of famous Victorian Houses known for their identical architecture, but most notably known as the location of the Tanner family picnic during the opening credits of the 1990s TV show Full House. This photo was taken in November 2008 at Alamo Square park facing the San Francisco skyline. Check out the rest of my photo blog including an old Victorian house in Maine! Painted Ladies of San Francisco by Joey B. Lax-Salinas is licensed under a Creative Commons Attribution-NonCommercial-NoDerivs 3.0 Unported License. Permissions beyond the scope of this license may be available at http://www.joeyblsphotography.com.